Since the establishment of digital media, the use of the internet has gained great importance in the agricultural sector. Agricultural websites have become increasingly popular. This applies particularly to traktorpool, an independent market research study – AgriMA 2013 – has recently shown that traktorpool is the market leader. The results of the latest market research study conducted by “Produkt + Markt, Wallenhorst” are clear: more than 60% of the participating farmers stated that they would use Traktorpool most frequently. Proof that www.traktorpool.de is the most popular website of its kind in Germany. The agriMA 2013 study was conducted between November 2012 and February 2013. On a random basis, 2024 farmers – from both the western (1759) and eastern (265) part of Germany – were asked about their use of agricultural media. The study implied both their use of regional and national agricultural trade papers and agricultural online media. 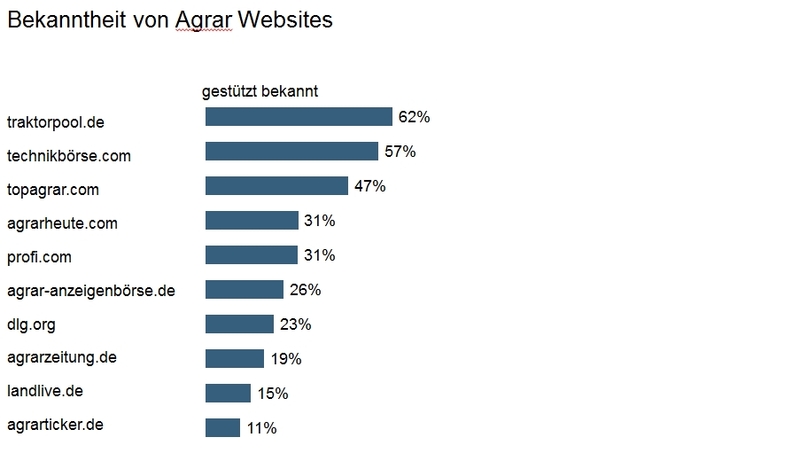 Not only is traktorpool the most widely used online agricultural market place, with 62 % market recognition it is also the best known agricultural website in Germany. And as if that were not enough: The study also showed that traktorpool is used by about 106.600 people, which constitutes the highest number of users among agricultural internet portals. Compared to an earlier survey conducted in 2009, the popularity of traktorpool has increased by 37 %. Naturally, we are very happy about such amazing results. We are constantly working to improve our market place and this can only be achieved with the help of our users. Thus, we are always happy to receive any kind of feedback – be it requests, ideas, criticism or suggestions for improvements. We look forward to your feedback and are keen to put your ideas and suggestions into practice. Previous Previous post: Das sind die traktorpool Messe-Deals!